Canadian Living is ready to meet the demand for more delicious meat-based recipes with fresh inspiration for your recipe box. 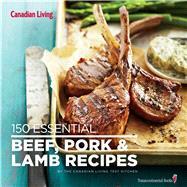 In its new book 150 Essential Beef, Pork and Lamb Recipes, Canada's most-trusted cooking authority has rounded up 150 of its best-loved beef, lamb and pork recipes -- all Tested Till Perfect by the experts in The Canadian Living Test Kitchen. Beef, lamb and pork are all delectably represented. Simple dishes, such as burgers, stir-fries and chops, are perfect for weeknight cooking, when you need something delicious and nutritious on the table fast. Show-stopping roasts and restaurant-quality mains are ideal for entertaining, when you're looking for something a little more special. Homey soups and stews are also well represented, giving cooks plenty of options for tasty, nutritious meat-based main dishes all year round.